Openness, Receptivity and Cultivating a "Beginner's Mind"
Originally published in the International House of Reiki newsletter. "In the beginner's mind there are many possibilities, but in the expert's mind there are few." This quote by Shunryu Suzuki illustrates what I believe is an important fact that all Reiki practitioners and teachers should remember. To me, one of the most of the most important qualities we can nurture within ourselves is that of receptivity-the quality of a beginner's mind. When we are receptive, we are open, and when we are open, the flow of the universe is easy to access and clear in its message to the heart. When we are open, healing becomes at once effortless and powerful. Being open is not always easy, but when I look back over my life, I can easily see the healing I have received from the people and animals that have crossed my path when I cultivated an inner spirit of receptivity. I owe a lot in my life to animals. They served as my best friends and confidants as I grew up, and have always been by my side, helping me through life's hurdles. 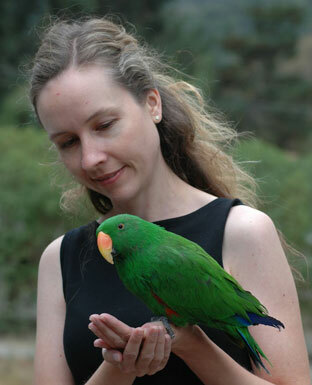 For me, it's easy to be open to animals-perhaps that's why they have become the focus of my Reiki practice. In the beginning days of my practice, I imagined I could "save the animals of the world with Reiki." Over time, I have come to learn that the healing and assistance of a Reiki experience is two-way-often it is me who receives healing. Perhaps the biggest hurdle the animals have helped me over is beyond what I had ever imagined for myself-reaching and teaching people how to help their animals with Reiki not just locally, but nationally and even internationally. And now as I await the release of a Healing Quest PBS segment I recently filmed doing Reiki on a variety of animals, I ponder, wow, how did I get here? As usual, the answer is-the animals! I also sometimes find myself pondering-exactly, where is this all going? Well, wherever this goes, it's for the good of the animals! I'm a wallflower really-no, really! I know it may not seem so, having taught more than 2,000 students worldwide about Reiki for animals, but actually I grew up very shy and introverted. As a student, I was always much more comfortable in the back of the classroom, never raising my hand. Cameras? No thanks. Crowds? Yikes! Traveling? Umm, maybe next year … . Yes, being alone and at home has always been a comfortable state of being for me. Then along came Reiki. And as Reiki swept into my life and carried me away on its vast wave of swirling change, suddenly new possibilities began to present themselves. As the animals (my own, other animals in my life and even unknown animals) came forward to literally demand that they be a part of Reiki in my life, their people also followed. They wondered about this amazing modality that could create peaceful responses and connections in even the most highly stressed and nervous animals and situations. And so I began, out of my love of helping animals, the long journey of coming out of my shell and meeting many new people to share a combination of two things I love most (well, besides my family), and what seems to resonate to the very core of my being-Reiki and animals. But although I may have begun this journey thinking I was the one offering the healing and teaching support, experiences with animals and their amazing ability as healers as well as getting to know my students through their experiences with their animals have often caused me to ask the question, who is actually helping whom? One of my first, and perhaps (by attendance) most successful, classes is my Animal Reiki Workshop: Core Curriculum by Correspondence class. This class, offered for Reiki practitioners seeking a foundation in animal approach and ethics, is done completely through e-mail, so it is ideal for people living far away. Each week students read the lesson and receive a homework Reiki practice to do with an animal based upon the lesson's teachings. Students then e-mail me their treatment results along with questions that come up. In writing and preparing this class and responding each week to students' notes, my initial motivation was to help to "teach" them something to assist and empower them in their connections with other species. However, as the years go by, I realize that once again, just as it is with Reiki experiences with the animals, with my human students, the lessons, support and assistance go both ways. Receiving notes on personal experiences from my students who've completed their Reiki homework assignments far away from my California home-on animals such as wild dogs in the deserts of Saudi Arabia, homeless animals wandering the urban streets of India, animals in hospice in England, therapy animals in Australia-have provided me with amazing opportunities to know and understand more about what Reiki for animals can and does do for the animals; but also, it has revealed to me how, in turn, animals change and improve people's lives and heal their souls the world over. I feel so much gratitude for my students and their wonderful work with animals-for besides supporting the animals in so many places around the world, they have shared with me the gift of their experiences, teaching me more than I would ever have been able to discover alone, even if I was traveling the world constantly for many years over. In addition, I owe a lot to one of my human Reiki teachers: Frans Stiene. His approach of quiet, meditative self-practice-a "less is more" philosophy-has helped me to go deeper within my own healing, as well as with the animals and my teaching practice. And Frans is a living example of cultivating receptivity and retaining the "beginner's mind." I have watched him connect (it seems, so effortlessly) to so many students from a true place of openness and humility. And in that connection, healing seems to organically arise. It is really an inspiration to me. And so, returning to an observation of my early, introverted self, I can now say that thanks to all of my teachers-both human and animal-I have realized that it is often by reaching outward and connecting to others that we can learn more about ourselves and rediscover our true inner nature of oneness. We are never really alone; we are always connected to each other. And in my experience (and that of so many of my students), this reality of connection is a state of being that the animals can help guide us toward. It is my wish, and I can now say this with confidence, that I may use my knowledge and experience to further educate people about Reiki for animals throughout the world. To me, a world of animals and Reiki is a world of true and limitless compassion. If we can all learn to hold onto an open and receptive "beginner's mind," I know this world can come to be. I look forward to the unfolding of my own healing journey and continue to hold a vision of a planet where all of us-humans and animals alike-are receptive to the inherent spiritual and energetic wisdom of all species.